Former prime minister Stephen Harper speaks at the American Israel Public Affairs Committee (AIPAC) policy conference in Washington on March 26, 2017. 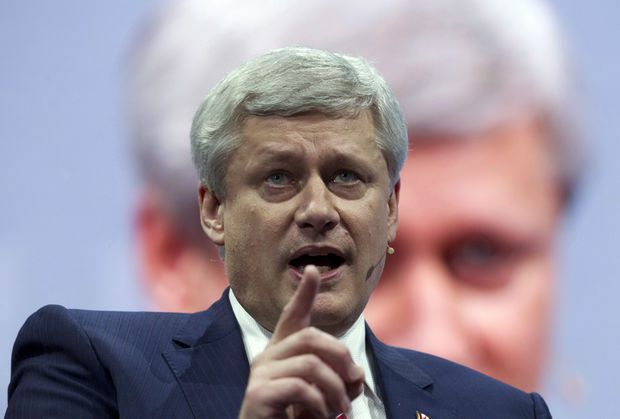 Stephen J. Harper was the 22nd prime minister of Canada, from 2006 to 2015. His new book, Right Here, Right Now: Politics and Leadership in the Age of Disruption, will be published October 9. For the vast majority of the world’s people, life today is longer, healthier and wealthier than at any other time in human history. Accelerating technological innovation promises great advancement at an even more rapid pace. It should be the dawn of a great new age. Yet there is growing anxiety and uncertainty about the future. In advanced democracies, this is particularly acute. More and more people in the West are questioning our economic and social trajectory. Many do not feel they are getting ahead. Amidst the technological, economic and social change they are experiencing, they see less opportunity for their children than they had for themselves. The manifestation of this unease is a series of new and unorthodox political movements in most of the democratic world. From Brexit to Donald Trump and the “populist” parties of Europe, their success has hit establishment institutions with successive surprises that are provoking reactions leading from confusion to alarm and to outrage. Where is it all going? Will technology really transform society for the better? What can be done to calm the waters? What can leaders – political, social and business leaders – do about any of this? I have spent the past couple of years watching and reflecting upon how various forms of disruption are affecting advanced Western societies. My conclusions are twofold. First, we have much to be optimistic and hopeful about. We really are living in an unprecedented age of freedom, wealth and opportunity, with greater possibilities to come. But second, further advancement is not guaranteed. For too many people, things are not getting better. If we do not start to address this reality, increasingly dysfunctional politics threaten to take us down the wrong path. Nov. 12, 1989: A man hammers away at the Berlin Wall as the barrier between East and West Germany is torn down, symbolically ending the Cold War. I began my political life in what turned out to be the final years of the Cold War. The conservative revolution that I supported as a young man quickly brought that era to an end and ushered in a new one – the era of democracy, free markets and globalization. The model that had created our economic prosperity and political stability for the West spread around the world. In more countries than ever before, it became the norm for political power to transfer peacefully between governments. Legal systems became more transparent and rooted in objective norms. More jobs opened up for the perennially poor, while more educational opportunities became available to the children of the relatively prosperous. And yet, despite this progress, the word commonly used to describe change today is “disruption.” I do not see disruption as a mere synonym for change. In my mind, change is part of the natural order. It is unceasing, organic and unavoidable. Disruption, on the other hand, is the far more methodical cousin of change. It is a deliberate and strategic effort to displace and to replace a status quo of some kind. For many, the word inspires hope for the future. In some circles, it is used almost as a rallying cry for a tomorrow defined by new thinking and better leadership. Many tech entrepreneurs personify the word. I think of someone such as tech entrepreneur Joe Lonsdale. He views business and investment opportunities through the maxim: “The world is broken. Let’s fix it.” He is not alone. He represents a whole generation of very young yet extraordinarily high achievers. In areas that range from health care to transportation, to housing and lifestyle options, they are doing many things that are concrete and clearly positive. 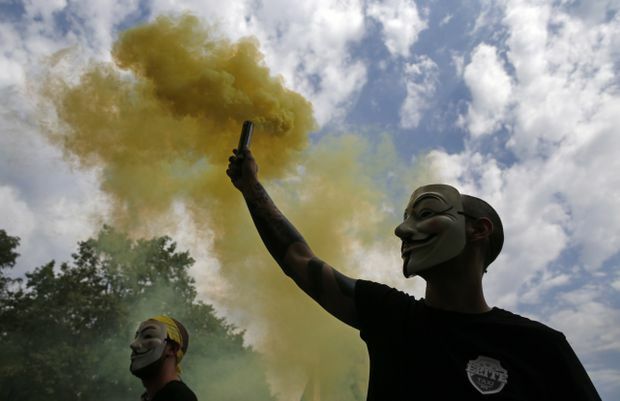 July 25, 2018: Protesters burn flares during a taxi strike in Barcelona. Taxi drivers held a 48-hour strike to protest against the rise of ride-hailing apps like Uber and Cabify, Silicon Valley startups that they accuse of unfairly disrupting their livelihoods. But, in spite of this momentum, many citizens in advanced Western democracies view disruption as a threat. They see globalization, data analytics and the digital economy through a very different lens than the software engineer. Can you blame them? Whole industries are coming and going. Businesses appear to be seeded, scaled and transformed into multibillion-dollar entities in the blink of an eye. Jobs and work are being radically reshaped, not just by technology but from global competitors. It is eminently reasonable, even sensible, for citizens to be anxious about the consequences of disruption. Some of the consequences have not been good. In the United States and Europe, wages for many citizens have stagnated. In some cases, they have dropped outright. Good, stable jobs, benefit packages and pension plans have been replaced by the gig economy, temporary work and ongoing economic uncertainty. Jobs in traditional sectors have been lost by the millions. For example, one-third of U.S. manufacturing jobs have disappeared in the past three decades. It is also a fact that some trade relationships have become brutally imbalanced. The China-U.S. trade relationship is now 4:1 in favour of the Chinese and the gap has only been widening. In many countries, with low-wage workers already under pressure, low-skilled immigration has actually accelerated. These trends represent real costs to real people. Why should we be surprised when, ignored by traditional conservatives and derided by traditional liberals, these citizens start seeking alternative political choices? If policy does not seem to be working out for the public, in a democracy, you are supposed to fix the policy, not denounce the public. But, if you listen to some leaders and much of the media, you would not know it. Their response is wrong, frustrating and dangerous. Wrong, because most of today’s political upheaval has readily identifiable causes. Frustrating, because it stands in the way of credible, pragmatic solutions that do exist. Dangerous, because the current populist upheaval is actually benign and constructive compared with what will follow if it is not addressed. 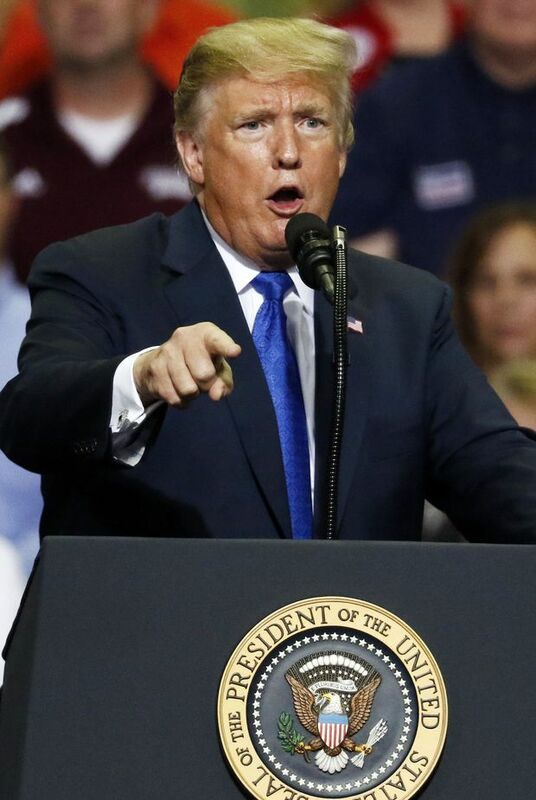 Oct. 2, 2018: U.S. President Donald Trump inveighs against Democrats in Congress at a rally in Southaven, Miss. The presidency of Donald Trump consumes much of the oxygen on this subject because he is the biggest example of political disruption to date. His win was stunning. As a political novice, he beat the two most sophisticated political machines in the Western world. But he is not an isolated case, and to focus only on Mr. Trump is to miss the bigger picture. Over the past two years, most major democracies – the countries that have been the world’s most stable for decades – have been undergoing major political disruption. In Britain, voters delivered a referendum result in favour of leaving the European Union. Nearly two years later, the government is still wrestling with how to implement the decision. As Prime Minister Theresa May attempts to execute such a profound change, she must look over at the Leader of the Labour Party, Jeremy Corbyn. As extreme and troubling a figure as any in democratic politics, polls say he could well become the next prime minister. In Germany, a right-wing nationalist bloc has entered the Bundestag for the first time since the Second World War. As a result, it took Angela Merkel, Europe’s most experienced and reliable leader, nearly six months to form a governing coalition. And a weak one at that. In France, the National Front gained one-third of the vote in last year’s presidential election. This was simply unthinkable only a few short years ago. French President Emmanuel Macron ultimately stopped the National Front, but only at the expense of the country’s traditional political parties. His presidency is now in doubt as his reform agenda crashes against a wall of French political realities. Elections in Italy, Hungary, Poland and Austria have also produced outcomes where populists or nationalists now hold or share power. These are all very different countries, with a range of issues and economic conditions, but all experiencing the fruits of profound political discontent. April 6, 2018: Hungarian Prime Minister Viktor Orban attends a rally for his Fidesz party two days before parliamentary elections that brought him to a third consecutive term. 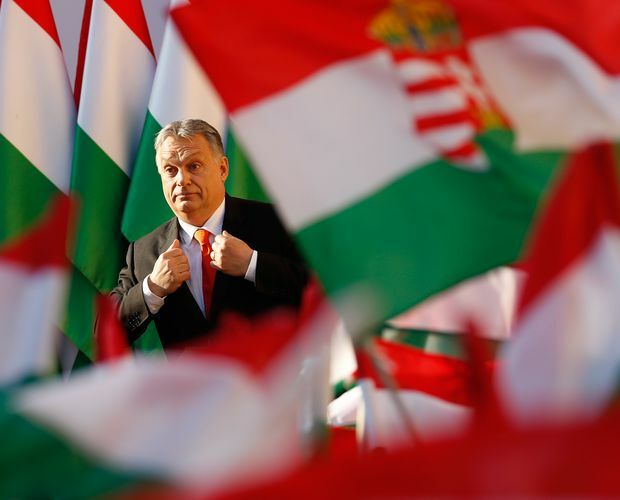 The leader, widely criticized for his autocratic tendencies and anti-immigrant policies, is one of several populists who have taken office in Europe in recent years. The reality is that, in the eyes of many voters, the correlation between globalization and good economic outcomes is weakening. So is the political consensus around its basic policy ideas such as freer markets, freer trade and freer immigration. In many countries, the global financial crisis, the bailouts for the few and the slow or non-existent recovery for the many have been gradually fraying the democratic social compact. Make no mistake: This trend is about more than just a few election results. There is a widening chasm in perspectives between establishment institutions and common citizens that is very worrying. It is a split between those who have global economic interests, and those who focus on local economic interests. It is a split between those whose lives cross borders, and those who live within them. It is a split between those whose identities are international and multicultural, and those whose are national and traditional. But most importantly, it is a split between those who believe they are getting ahead and those who can see that they are not. In other words, it is a serious error to view these political developments as merely the function of individual politicians or extremism at the margins of society. Many traditional centre-right and centre-left political parties are weakening. Some, especially on the centre-left, are simply breaking up. Let me return to the global financial crisis. I was there at the founding of the Group of 20 and the decision to pursue extraordinary, co-ordinated global measures in 2008-09. Some of these, such as massive fiscal stimulus, are matters I would never have advocated under even ordinary recessionary conditions. Nevertheless, I spoke forcefully for them to stop the collapse and restore confidence. They were necessary and essentially successful. The world did not slide into a decade of economic depression, as it did under similar circumstances in the 1930s. Nov. 15, 2008: Mr. Harper, top right, stands for a group photo at the 2008 G20 summit in Washington. With him, from right, are Saudia Arabia's King Abdullah, Indian prime minister Manmohan Singh, Chinese president Hu Jintao, Turkish prime minister Recep Tayyip Erdogan, U.S. president George W. Bush and Spanish prime minister Jose Luis Rodriguez Zapatero. Looking back today, it is pretty clear that long-term damage was done. It was not just financial and economic, but deeply social and psychological. Citizens had been conditioned to believe that they should manage their finances prudently, plan for the future and strive for a life independent of government support. But, when it all went sideways, that was not the path taken by those who had told them to do so. In the United States and Europe, some of the biggest financial institutions received bailouts and generous compensation packages while ordinary people lost their homes, jobs and savings. Those people then had to listen to many of those same institutions squawk about the interference of government in their industries. In Canada, we have not been experiencing the political disruption that other Western countries have felt. It is not hard to figure out why. We had no bank bailouts. Our recession, though significant, was relatively shallow and short. And the populist-conservative approach my government took over its decade in office sustained modest economic growth that was shared across the various income brackets. I continue to believe that our political longevity and success was thanks to our focus on the challenges facing working people and their families. Day in and day out, I served with colleagues who were substantive people, who worked hard and who were committed to things bigger than themselves. We were not perfect, but our record does offer a blueprint for those interested in exiting the current political dysfunction and building sustainable market, trade, globalization and immigration frameworks. While our policies are now squarely in the history books, they can be used as precedents against those who claim our options are zero-sum. They are not. We do not face a stark choice of libertarianism or socialism, of free trade or protectionism, of global responsibility or national loyalty, of wide-open borders or xenophobia, of technology or irrelevance. Our experience demonstrates that it is possible to navigate today’s challenges successfully and without widespread social alienation. Oct. 19, 2015: Mr. Harper gives his concession speech in Calgary after the Liberals' federal election victory. Now more than ever, political, business and civic leaders must embrace the fact that ours is an age of rapid transformation, significant risk and sometimes bad outcomes. Our continued success is not inevitable nor can real problems be solved with provocative slogans and vapid virtue-signalling. There is no substitute for rolling up one’s sleeves, knowing the facts and monitoring the results. Our leaders must accept that today’s populist movements have identified real problems in Western society. The benefits of economic growth cannot be allowed to amass only at the top. The job gains of a trade relationship cannot accrue mainly to one country and the job losses only to the other. Nationalism will not and should not go away, but global co-operation in many areas will remain essential. Any good immigration policy requires sovereign control and the rule of law. Today’s political leaders must give up on the idea that the concerns of significant segments of the population can be dismissed or denigrated. Business leaders can no longer ignore employee anxiety about the future of work and the consequences of automation. Technology entrepreneurs cannot disdain tax laws and regulatory structures as mere archaic concepts incompatible with the digital economy. Oct. 2, 2018: A Trump supporter holds up his hat at a rally in Mississippi. Returning to the example of the United States, one needs to take a breath and step back from the personality, rhetoric and hysterical commentary around Mr. Trump. Despite his objectionable style, the President is, in many areas, attempting to address the causes of the populist discontent that have overturned American politics. We cannot yet know if he will ultimately be successful. But, in the United States and elsewhere, the populist tide is likely to continue to swell until pragmatic, resilient and sustainable solutions are brought into force and citizens see better outcomes for their families. I am actually fairly confident that the democratic capitalist world will emerge from this period better and stronger. Societies based on these values have shown themselves to be remarkably resilient and adaptable in the face of profound disruption before. This is all the more so when such change offers positive possibilities. Still, to seize the full potential of the moment, smart leaders in politics and business must begin to recognize the great peril in meeting the concerns of average citizens with dogma and condescension. Instead, they must recommit to practical change based on real-world experience and a clear-eyed assessment of results. This is not easy work, but it must begin, right here, right now.